Happy National Black Dog Day! – It's a Pibble's Life! It’s October 1st and that means it’s National Black Dog day! What a great pet holiday to bring awareness to all the black dogs out there and help break the stereotype! Why on earth would black dogs have their own holiday you ask? Did you know that black dogs are one of the hardest dogs to find homes for? It’s true! On top of that..if you’re a black dog and a bully breed (or any breed considered “dangerous”) finding a forever home could be an impossible mission! Reasons for potential adopters overlooking black dogs could be superstitions, negative labels or fear. Lots of humans are scared of me when they see me walking in the off leash trails or even on the street when I am on leash! They look at me like I am going to jump up and attack them (maybe with kisses!..). I don’t know why anyone would think that, I have a few black dog furiends and they’re all great! This is my pawddy Ayra! Arya is 3 years old and was adopted at 12 weeks from a pibble rescue group. Her mom was a breeder dog and pregnant when she was rescued from a bad situation. 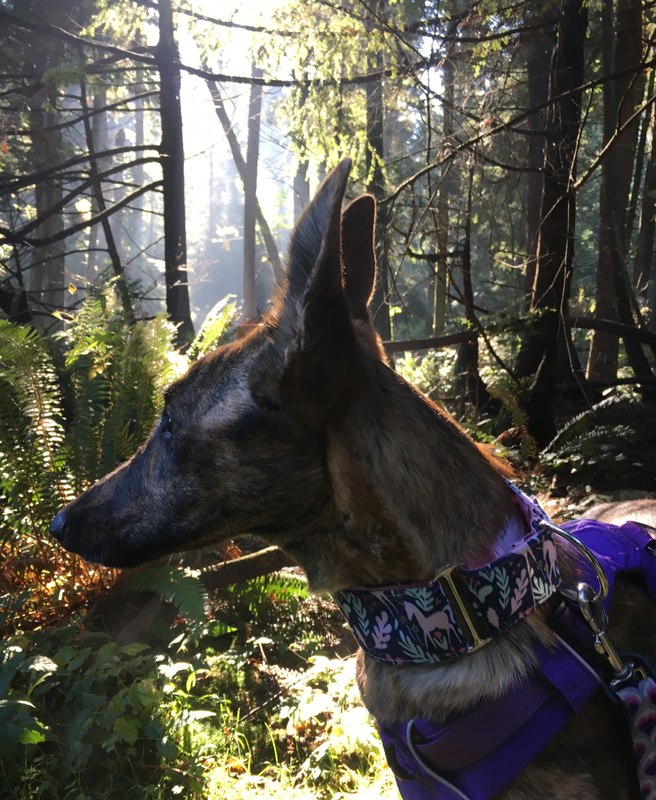 Arya’s humom says Arya really rescued her from heartache after losing her last pup. Arya loves belly rubs, ChuckIt balls, her dog and cat siblings and is scared of citrus fruit BOL! She is such a sweet lover and has never met a person she didn’t love! You can check out her Instagram page by clicking her photo below! Another Instagram pawddy of mine is Pyper! We’ve actually met at the beach before too! Pyper is super fun and sweet and we look like we could be sisters! She lives with her two humoms and a little fursister cat! Pyper was an urgent foster and quickly became a foster fail. She was rescued from a high kill shelter in San Bernardino. She has helped her family overcome their fear of dogs and is the reason two of her humans’ friends have adopted bully breeds. She also welcomes and helps teach all new foster dogs. Pyper doesn’t play much like fetch or tug and doesn’t like getting dirty but in her humans’ eyes she is perfect. She came into their lives and stole their hearts! Click on her photo to check out her Instagram page! Last but not least is my furiend Lucy!! She looks like my sister from another mister! We both have what’s called a reverse brindle but in certain lights we look black. I look a little more black than she does. Just look at that adorable face!!! Lucy has an interesting story of how she got adopted. Lucy’s humom saw a lady in the parking lot of Food City with Lucy and walked over to pet her. She found out that the Lady was on the way to the shelter to surrender her! Lucy’s humom offered to take her and promised the Lady that she would find a good home…and the rest is history! Lucy’s hudad jokes and says they got Lucy “in the peanut butter aisle at Food City, next to the jelly But they don’t carry dogs anymore” BOL! Lucy is very loving and smart but her strongest trait is compliant. Once she understands what her humans want, she always tries to do that. Her love language is touch, and she also loves to be praised. She adores people and gets along with every dog she meets. She loves to run and play and wins over everyone she meets! Malou: AHEM!! I think you forgot about me??? Malou: Look at me! I’m black too! How come you’re not introducing me? Just look at my beautiful black furs! Black cats like me have a hard time finding homes too! Mia: Oh well..um…today is National Black DOG Day Malou. You’re a cat…. Malou: Pfft…Big deal…I can bark! WOOF!!! See?? I hope you all enjoyed reading about some of my furiends! If you guys meet any black dogs today I hope you’ll stop and say hi to them! Maybe even give them a little pat on the head or an ear scratch! With Elsa being the latest addition to the Ranch, we are huge fans of black dogs and frankly confused why people would avoid them though I notice most people reach out first to pet Sam before they realize Elsa wants to get in on the ear cuddles when we’re out on our walks. So sad. Black dogs have so much sweetness to offer. Thanks for featuring some very good looking and sweet black dogs. We are huge admirers of sweet pibble, Lucy but I didn’t realize she was picked up in the peanut butter isle 😆(but did know she was the result of her mom failing at fostering-yay!). Yeah people always notice Keiko first but more people have been saying hi to me too these days. I didn’t know about Lucy’s story either! What are the chances! Thanks! ❤ I love reading about foster fail stories! 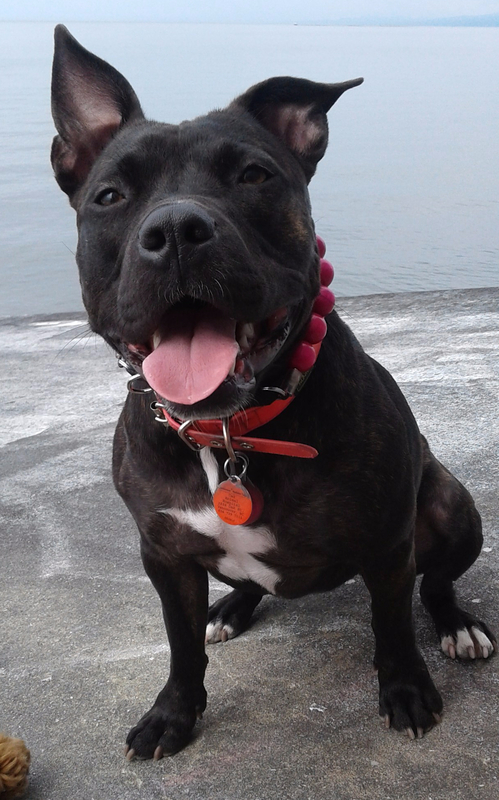 Thanks to Mia the Pibble for including Lucy in her great Black Dog Day post! Thanks for letting me use some of your pictures!! WE ARE THE BEST! Black dogs rule! Awww…Well my humom didn’t even know it existed until she saw it on blogpaws! BOL! Black dogs rule! It was fun meeting some of your friends, Mia! Loved your post, Mia. I didn’t celebrate with Tippy either – failure as a black dog mom, I guess. I don’t know why people avoid black dogs either. I know it is worse in other countries…I think superstition has a lot to do with it. Yeah definitely superstitions like black cats. I guess we can look scary too to some people. Pingback: Friday Forest Fun with Friends! – It's a Pibble's Life!